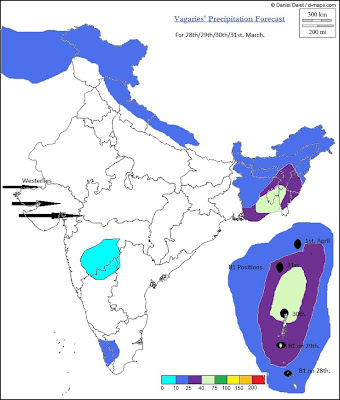 Vagaries' weekend forecast for the sub-continent, was almost "adhered to", if i may use the terminoligy, in terms of temperatures and weather systems. Sub-Continent Weather Forecast for Mon/Tue/Wed/Thursday; 28th,29th,30th. 31st.March.Click here. Vagaries' analysis is towards sporadic rains for Mon/Tue/Wed for the states of Kashmir, H.P. and hills region of Utteranchal. Resulting from a fading M3. This system slides into Nepal on Monday. 93B is still at 1008 mb at 8.6N and 96.9E. Sustained winds are at 15 knts. A variety of forecast estimates and opinions are given about B1. Vagaries estimates B1 to sustain in strength up to a minimum of 1004 mb (same as earlier estimate), and now that M3 is fading, move a bit Northwards from its current position. Expecting the system to fizzle out somewhere in the North-Eastern Bay region by 2nd. April. low will deepen and hover around the region, for almost 4 days till the 2nd. Line of wind discontinuity, now runs from Gangetic West Bengal to south Tamil Nadu across Orissa, south Chattisgarh, Telangana and Rayalaseema. However, now at 0.9 km asl, its shifted as an UAS, and is a trough line. Likely to dis-integrate soon, the eastern end of the trough will deepen a bit, and result in precipitating heavy rains in the NE states. Bangladesh, will receive heavy rains on Tuesday, as the trough deepens in the NE region. A trough running from Iran coast eastwards along Sindh coast into Gujarat will create some gusty and strong west winds along the regions. Gujarat will be very windy with strong westerlies at 30 kmph. Temperatures will be contained in the plains of Northern India, with no heat waves. The odd city in Rajasthan could just touch 40c. Delhi remaining dry and around 36/37c. Vidharbha region will touch a high of 42c next 3/4 days. For Nagpur, 42c is just round the corner. Northern regions of Pakistan will get some sporadic rains in the next 2 days. For Islamabad, Monday will be cool and cloudy with a shower, keeping the day cool at 25/26c.Days will not exceed 31c on Tues/Wed. Rest of Pakistan will be mostly dry. Windy westerlies in Karachi next 3 days will keep the high restricted at 32/33c. Highest in Sindh could be jumping to 43c before Wednesday. Nepal will get precipitation from M3 till Tuesday. Days should be cool, as Kathmandu was raining today and was at a day's maximum of 24.7c. Kathmandu should get some showers till Monday, but I doubt if the capital will even reach the month's normal rainfall of 30 mms. Total till now the month's rain adds up to 9 mms. Mon/Tuesday/Wednesday: Some clouding, around 2 OKTA, with NW breeze. Humidity set to rise. Direct sun will tend to be hot in the day, but a little relief in the evenings with NW breeze. Temperatures on all days will be in the 33c/25c range at Colaba and 35c/23c range at S'Cruz. yes, it can snow even at this time if a W.D. comes along. 11th. April is still almost 15 days away. Difficult to give the exact weather today, but yes, we can come to some forecast by the 3/4 April if thats ok. Please remimd me around 4th if you still need forecast for H.P. Normal for Manali around mid april would be a day temperature of 21c and 7c at night.